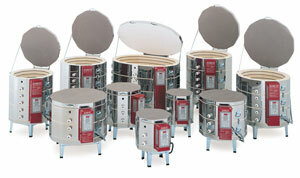 Skutt's KM Series kilns offer electronically controlled, digital firing with traditional Skutt features and quality. Automatic kilns provide firing accuracy, convenience, and repeatable results. There are no more junior cones to buy, store, or set. You can easily fire betweeen cones too, by entering an exact temperature into the program. For advanced artists and production studios, it means more precise control and less time spent monitoring firings. For the hobbyist, it means more enjoyment of the creative work and fewer worries about switch settings. Control features include a power switch, a smooth touch pad, a digital readout showing prompts, messages, and temperature,an alarm setting, delay firing option, and more. 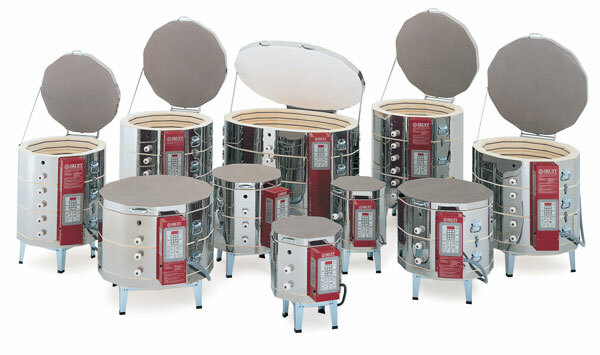 KM Series Kilns offer slow, medium, or fast firing speeds. Use cone fire mode to let you enter desired cone number. Limited 2-year warranty, UL and CSA listed. KilnMaster Touchscreen Controller Upgrade Kit — This kit features touchscreen technology that is super-intuitive and easy to use. A Guided Start feature helps even first-time users successfully enter programs, and an innovative hinge mount allows for positioning the controller to the proper angle for viewing, which eliminates awkward angles when entering programs. A downloadable app allows for remote temperature monitoring. Help Screens walk users through every procedure. Three Phase Kilns — Three Phase electric power is available in many industrial and institutional buildings, usually with 208V power. Most facilities with Three Phase power also have separate circuits for Single Phase power. Single Phase electric power is the standard alternating current (60 hz) that is available in all homes and offices in North America, usually with 240V power. A single phase kiln can run using Three Phase power with additional equipment and wiring. Where Three Phase power is available, most high amperage circuits (that might be used to run a kiln) will be Three Phase circuits. Although electric motors such as ventilation fans run more efficiently (require fewer watts) on a Three Phase circuit, kiln heating elements do not. However, it is possible to run a Three Phase kiln using a smaller (lower amperage) circuit than would be required for a comparable Single Phase kiln, if power capacity (amperage) is an issue. Three Phase kilns will not run on Single Phase power. Always consult a licensed electrician before installing a high power electric kiln. 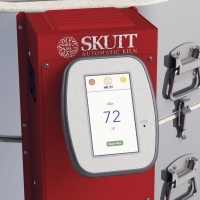 To view a PDF of the Operating Manual for the Skutt Kilnmaster, please click here. To view a PDF of the Warranty and Technical Support Information for the Skutt Kilnmaster, please click here.